The squid and the seahorse are great, but the learned fish guzzling hooch is without peer. Got these at Paxton Gate the other day. 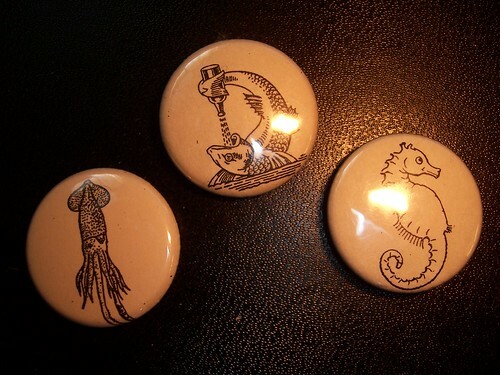 pins, originally uploaded by allanhough. I’ve always wanted to vote for a female presidential candidate, I’ve always wanted to vote for a black presidential candidate, and I’ve always wanted to vote for Matt Gonzalez in a national race. Link to that picture of Matt and Joe Strummer. As much as I liked Wes Anderson’s AT&T commercials, I like this Billboard Liberation Front effort even better. The Big Word Project is selling definitions. Choose any word in the English language, and for $1 per letter, you can buy a word and assign your website as the definition. I got “mission”. As of press time, “horseshit” is still available. This is the last one, we promise. 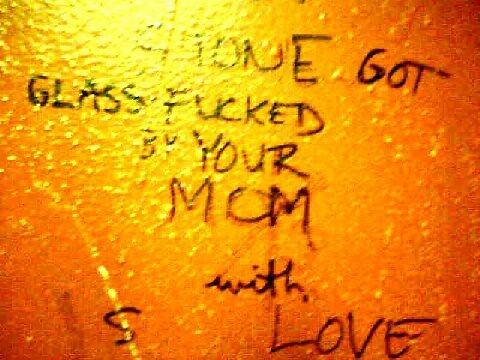 If the city manages to curb public displays of graffiti via a monetary reward for tattletales, we’ll always have rock club men’s room walls. This gem got took in the shitter at 12 Galaxies. Previously on Mission Mission: Rat-for-Cash Initiative Bad for Art? glass fucked, originally uploaded by allanhough. If snitchy-snitch crackdownin’ puts the freeze on the aforementioned “high-concept” anti-“yuppie” posters, fine. But “In The City We Trust” is a decidedly affirmative message, and not bad looking. Please don’t call the cops on this work of art’s creator. Caught this on the wheel well of an outbound 49-Mission. 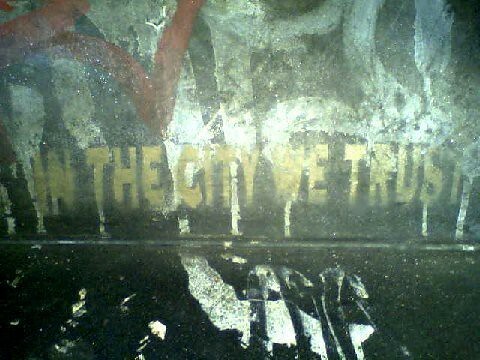 in the city we trust, originally uploaded by allanhough. Does Having Disposable Income Enough To Keep One’s Self In Glossy Black Construction Paper And Professional-Quality Gold Paint Pens Make One a Yuppie? Perrrrrrhaps. 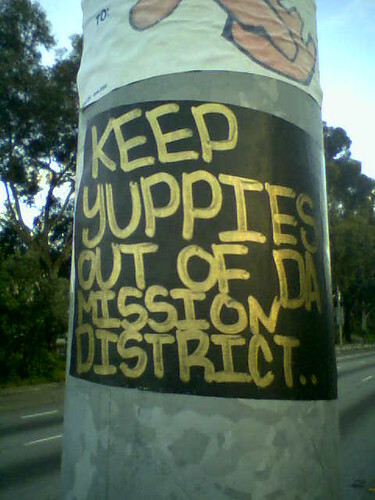 “Keep yuppies out of da Mission District?” It just seems like a lot of leisure time and a lot of capital went into this project. Photographed on the outskirts of said district, at the J-Church stop at San Jose & Randall. Author Allan HoughPosted on February 28, 2008 March 6, 2008 Categories GraffitiLeave a comment on Does Having Disposable Income Enough To Keep One’s Self In Glossy Black Construction Paper And Professional-Quality Gold Paint Pens Make One a Yuppie? Perrrrrrhaps.